Gough and Kelly are working closely with the Counter Terrorism Policing to encourage the public to remain vigilant, look out for suspicious behaviour and inform people how to report their concerns, providing a ‘whole society’ approach where police, security staff, retail workers and the public come together to minimise the chance of attacks and mitigate the impact they can have. This is through a new initiative, ‘Step Change’, which aims to bring the public and private sectors together to collaborate on security matters – meaning retailers and other businesses, operating in crowded places, are also being asked to play their part in countering the terrorist threat. Businesses can do this in two ways, the first being to sign up to ACT Awareness, the innovative online training scheme designed to help industry better understand, and mitigate against, current terrorist methodology. Developed in a ground-breaking partnership between Counter Terrorism Policing and retail giant Marks & Spencer, it covers how to spot the signs of suspicious behaviour and what to do if an attack should take place. Free to use, the course can be divided into short sections to suit business needs. However it takes just 45 minutes in total to complete – 45 minutes that could save lives. 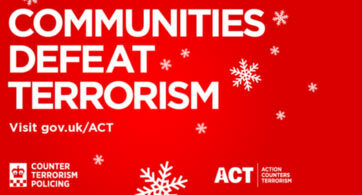 Secondly, experts from Counter Terrorism Policing are asking businesses to think about their contingency plans this Christmas, asking them to draw up a ‘Sixty Second Security’ plan which has the power to improve their reaction to emergency situations. Who is appointed to make decisions on the shop floor and do they know what they’re doing? How do you communicate and how do you stay updated if you find yourself in a RHT scenario (Run, Hide, Tell)? “All staff working in crowded places – not just those who have a security role – can follow the ACT Awareness e-Learning course and be in a stronger position to help protect themselves, colleagues and the public. I would also like to ask retailers and other businesses to consider my ‘Sixty Second Security’ plan, which is a quick checklist of questions every member of staff should be able to answer in order to drastically improve reaction times in the event of an emergency. Last year on Oxford Street we saw a fight at a Tube station cause panic when people believed that a terrorist attack had occurred. In the rush to keep themselves safe, some people suffered serious injuries and businesses were severely disrupted. By working alongside those businesses, we have learnt from that experience and I believe that our ‘Sixty Second Security’ plan will better prepare us to deal with something similar in the future”.